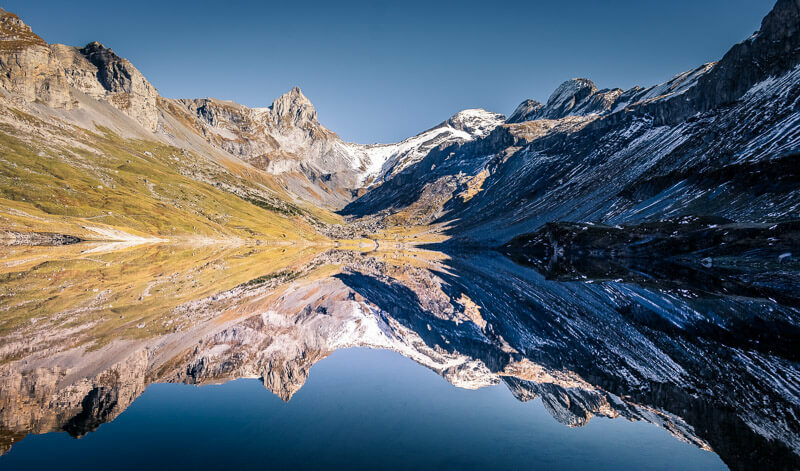 Clearly, Switzerland is well-known for its incredible landscapes and views such as in the Bernese Oberland, in Lugano, Zermatt or Lucerne, just to mention a few of the amazing places in Switzerland. Millions of tourist visit my home country to see it with their own eyes. 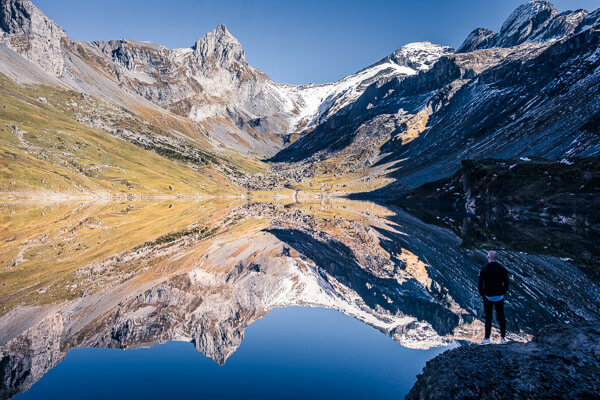 What many of the visitors in Switzerland don’t know though: There are some places that even most Swiss people don’t know – true hidden gems, which are located a bit outside of the main tourist areas, but even more rewarding in my opinion. One of them is the Glattalp, which I visited in fall 2017, and turned out to be one of my favorite locations in whole Switzerland. I will definitely visit the Glattalp again in the future. 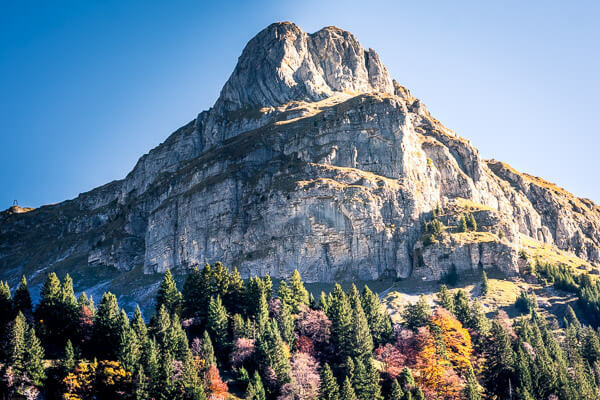 The Glattalp is in the Bisistal, which is located in the canton of “Schwyz”. It is a quite remote valley that is accessible by car or public transportation. For everybody that is not used to the Swiss map: It’s pretty much in the center of Switzerland. Nearby there is also a famous place called Stoos, where they opened the steepest funicular in 2018. Once you reach the Muotathal you will see the crowds of tourists that go there. To reach the Glattalp, you will have to drive much further into the valley – which results in way fewer tourists and a more remote feeling. After a drive of around 30 minutes, you will explore a small aerial cableway – the “Sahli-Glattalp”. It looked quite hilarious, especially because most Swiss mountain places have a huge infrastructure with modern equipment, well-prepared for the masses of tourists. However, this small cableway has its own charm, which makes the trip even more interesting. The tickets are not cheap though (24 Swiss Francs) but in my eyes absolutely worth it. If you are not as lazy as me you can also hike up there – it takes about two to three hours to hike up to the Glattalp. Like always in Switzerland, there are different ways to reach your destination. Important to know is, that the Glattalp is not open during the winter time. The aerial cableway usually runs from June to October. To get to the Glattalp by public transportation you will have to get to “Schwyz” and take the bus from there to a station called “Sahli”. You can check the schedules on the website of the Swiss train company. If you want to have a day full of activities, you can also combine it with a bike ride to the “Sahli” station. You could, for example, start from Schwyz (2 hours each way) and enjoy the remote valley while doing some more sports. What makes the Glattalp so special? Shortly after you arrive on the Glattalp you will have to choose a route for your hike. The fastest way to the absolutely beautiful lake of the Glattalp takes around 45 minutes, however, there are also way longer routes you can take. 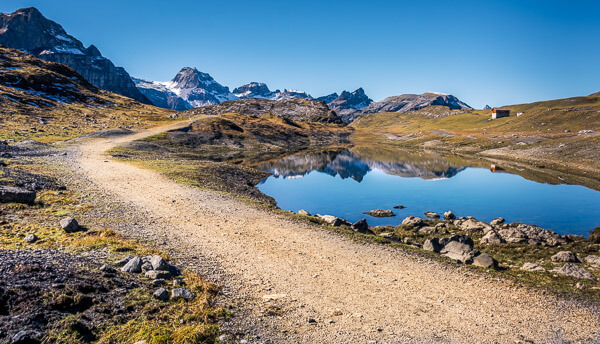 The path is an easy walk while you can enjoy being surrounded by the Swiss Alps. Exactly this makes the Glattalp so special: It is built like a basin and it’s therefore always windless and without any clouds. If you go there on a sunny day you will definitely get a sunburn. These special conditions also brought the Glattalp a record with the lowest temperature ever measured in Switzerland: -52,5 degrees Celsius. If you don’t go to the Glattalp on a busy day, you will barely meet any people, see some goats strolling around and breathe the fresh mountain air. That’s what I call pure nature. And then there is this moment when you eventually reach the lake and see it in its whole beauty. It makes you speechless. Never have I seen something beautiful like this before. The water is so clear that you can see the reflection of the summits like it would be a perfect mirror. Dependent on the angle I looked at it I couldn’t tell where the water begins or the mountains start. It was simply mind-blowing. I was happy that I brought all my camera gear and took some pictures. Surely they will show you the magic of this place better than my words. Probably I said “I can’t believe this” for 10’000 times to my friend. And this is just what I felt at this moment. Additionally, there are plenty of hiking routes starting from the Glattalp, which makes it a great spot for every hiker. Once you arrived at the top, you will see signs for all the available routes. Should you go to the Glattalp? For me that’s not even a question: YES! If you are looking for a remote place without many tourists that is still easy to reach the Glattalp is the perfect place. I will definitely go back there one day, probably in spring, to enjoy this view with some more colors. We also tried out the “Berggasthaus” there – which offers great traditional food for a fair price. However, there are also some points that you have to consider when going to the Glattalp. Firstly it’s not opened the whole year – with the temperatures going down extremely in winter this is understandable. Secondly, it can happen that you have to wait for the ride up there since the aerial cableway only takes 8 passengers every 30 minutes. For me personally, it’s absolutely worth to wait a bit to go there! For more pictures, you can always check out my Facebook page, where I post new pictures regularly. Hello guys! I am Michael, a freelance photographer and travel blogger from Switzerland. My goal is to inspire travelers all around the globe with my posts and images.